Cylinder wear advice from Esso lubricants. Homepage. This page: Advice on the causes of cylinder wear, and how to avoid it using Essolube lubricants. A 1930s' Essolube leaflet on the causes and prevention of engine cylinder wear. 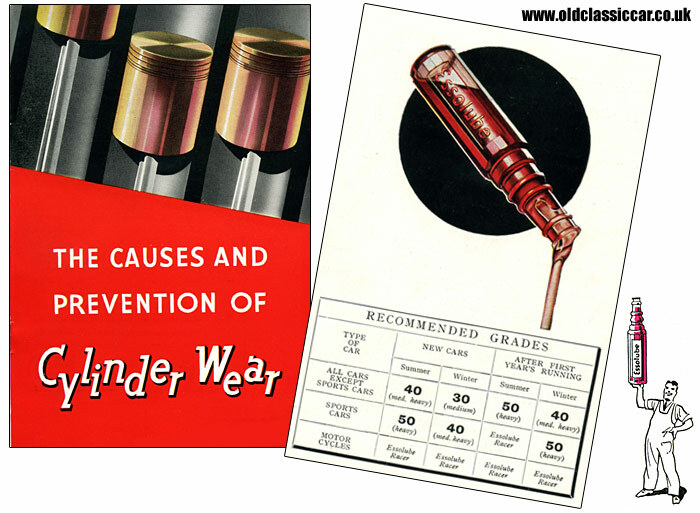 Despite its perfect condition, this Essolube leaflet dates to the late 1930s and, as the title on the front cover says, discusses "The Causes and Prevention of Cylinder Wear". A handwritten note on the booklet suggests it was printed in 1936/1937, yet much of the advice given within this Esso publication is as relevant now, as it was some 70+ years ago. The booklet is split into two sections, one discussing the causes of engine wear, the next how to avoid it happening in the first place. Interestingly, the leaflet explains why the oft-held notion that cylinder wear is due to the piston travelling up and down the bore, is in fact not usually the case. They say: ".. in recent years it has been clearly established that cylinder wear is attibutable to an entirely different cause. This is corrosion, and it occurs somewhat in the following manner: by the combustion of one gallon of petrol, one gallon of water is created. Exhaust gas therefore, in the cylinder is very heavily charged with moisture, and if it comes into contact with any cold or cool metal part, condensation occurs immediately - just as one's breath causes moisture to form on a cold window." This moisture, when mixed with carbon dioxide, which is itself another by-product of petrol combustion, forms a carbonic acid. The leaflet goes on to add that this resulting acid isn't particularly dangerous to the engine in its normal state, but when compressed during the combustion cycle, increases in strength by ten times. When the engine is cool, on initial start-up, the production of this acid is greatly increased until such time as the engine has warmed through, leading to large amounts of this acidic moisture forming on the cool metal of the cylinder walls. Despite being washed away on the next pass of the piston, microscopic corrosion of the bore will already have started. As the cycle is repeated, often several thousand times in just one minute, the compound effect of this continued attack on the bore's surfaces will add up to the cylinders wearing. While some level of corrosion is unavoidable, the leaflet strongly recommends that this period of cool-running should be kept to an absolute minimum. In cold weather, many drivers would therefore cover their car's radiator grilles, perhaps with a purpose-made radiator blind, or else a piece of cardboard stuffed between the grille and the radiator. The effect of lubrication on cylinder wear. The leaflet then looks at how lubrication reduces this cycle of damage taking place in the engine's cylinders. Some cars, it says, featured direct oil feeds into the cylinder walls, to ensure that a film of lubrication remained in the bores at all times. This was seen as a costly arrangement, especially when compared to very early car lubrication systems, that tended to rely on oil being thrown out from the big end bearings. In conclusion, the leaflet advises that to keep cylinder bore wear down to a minimum, oil that is fluid when cold (and gets to quickly cover the working area of the bores), and retains its body once warmed up, is the best solution - and in their opinion, Essolube would be the perfect solution. The rear cover lists some of the different monograde Essolube oils that were available from Esso garages both in the UK and abroad. Various other printed items issued by Esso to its garage network feature on this site, including this handy car servicing leaflet distributed by Carey & Lambert of Southampton. There is also a nice old photograph from the 1950s, showing a typical Esso garage, in the vintage photographs section of oldclassiccar.